[3.6] The retch insta-leech Berserker. first of all an apology for any misspelling. My English is not very good but I will do the best I can. This build is currently in process, so if you want to see a completed build, it's probably best that you come in a couple of days. the build is based on the unique item "the retch". In general, this build is based on a combo of objects and mechanics that can be abused if used together. and finally, you need the mod "Life Leech effects are not removed at Full Life"
To maximize the damage and get the vessel of vinktar as much as possible, I decided to turn all my physical damage into lightning damage. -watchers eye (conversion with wrath). and what about the skills? the passive tree? Well, at the moment I'm trying several skills, but I can mention which ones I think are the best ones to exploit the mechanics. for a single target, I think the best options are: blade flurry and / or molten strike. I'm using blade flurry because I do not want to spend on the helmet enchant, but probably molten is the best. and for clearing i'm using fliker strike right now. For clear maps you don't really need much damage, the vessel of vinktar is enought. but we want to exploit the mechanics, do tons of damage. For that we have Cloaked in Savagery. But how the hell do I get to have the buff whenever I want? well, this is my solution. the damage of doedre's elixir counts like a hit. 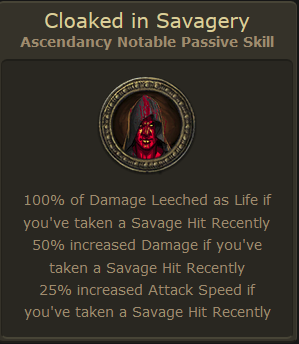 but is only 10%, a savage hit is a 15% of max hp hit. but you have no chaos resistance, you have aspect of carnage (10% increased Damage taken) and you have the bloody vessel of vinktar! if you use the vessel first, the elixir will do 50% increased damage(to you). tadaaan! savage hit in any moment. And, what about the dps? the retch deals 200% of your life leech. But, with this mechanic together, is the 200% of your "potential" life leech. we have 100% of life leech(berserker) + 20% (vessel of vinktar). so... is the 240% of your damage as extra chaos? i think is a lot. the damage increases do not work on the retch damage btw. you can watch the gems links here or can watch my profile. As I said before, the build is still in process. Any suggestion or feedback is well-received and appreciated (as well as any correction). I will be updating this topic in the following days.